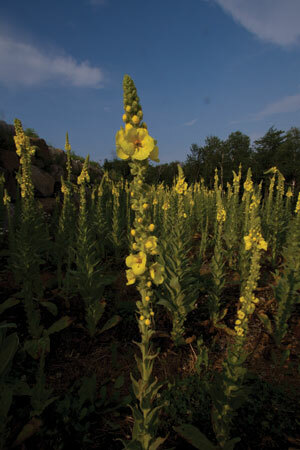 Mullein has been used in western herbalism for over 2000 years. Both the leaves and flowers were used both orally and even smoked for ailments of the respiratory tract. Mullein is a cross between a mucilage containing demulcent (like marshmallow) and a saponin-bearing expectorant (like licorice). In addition it possess some antiinflammatory and antispadmodic properties. It is used more for chronic than acute respiratory conditions and is primarily indicated for dry spasmodic coughs. Research shows that it possess antimicrobial actions including antiviral, antiparasitic and antibacterial. Historically it was used for a variety of infections including worms, colds, pneumonia, tuberculosis but its efficacy has never been researched in human trials.